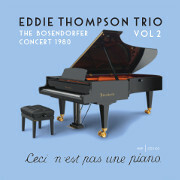 Hep Jazz News @ Hep Records, jazz in depth from the 1930's to the present day. All the latest Hep News from our raving reporter. Intriguing history of classic Shaw orchestra of late 1930's recreated by top New York musicians directed by James Langton and featuring Dan Levinson. Recorded on the 8/9th August 2016 at the Peter Karl Studio, New York. USA Distribution by Burnside Distribution Corporation, 6635 North Baltimore Avenue, Portland OR 97203. UK distribution by Proper Music Distribution, The New Powerhouse, Gateway Business Centre, Kangley Bridge Road, London SE26 5AN. This album contains the following tracks - Nightmare / Everything's Jumpin' / How Deep Is The Ocean / Them There Eyes / I've Got The World On A String / Leapin' At The Lincoln / Stairway To The Stars / Never Played Around Much / The Moon Looks Down & Laughs / On The Sunny Side Of The Street / Trav'lin' All Alone / Royal Garden Blues / Stardust / And The Angels Sing / In The Mood / You Go To My Head / Diga Diga Doo / Begin The Beguine. This album contains the following tracks - Isn't She Lovely / Here's That Rainy Day / But Not For Me / Blues For Big Jim / Medley - Solitude, Daydream, In A Mellotone, C Jam Blues, Take The A Train / Easy To Love / Sign Off. 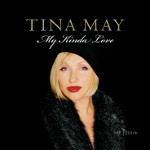 The annual British Jazz Awards for 2014 listed Tina May as runner up in the Vocals section for her performances on "Divas" and the album came in third in the New CD section. So what will they make of her follow-up ? Take a look below and try it out for yourself. This album contains the following tracks - On Green Dolphin Street / The JAMFs are Coming / Baubles, Bangles and Beads / Corcovado / Autumn Nocturne / Satin Doll / Robbins Nest / Sweet Georgia Brown. In recognition of the changing distribution of music Hep Records is currently in the process of converting the entire catalogue of all three labels to MP3 format. As a result there will be full availability of all items including those long unavailable on CD. In future all productions will be available on a limited pressing of CDs for those who prefer the physical item as well as in the downloadable format. CDs of existing productions will continue to be available as long as stocks last. The MP3 versions should be available from all of the usual suppliers. Due to very high airpost costs Hep regrets to announce that with immediate effect all CD orders for delivery outside of the EU will be mailed without the jewel cases. Customers outwith the EU who still want their CDs with jewel cases should place their orders through Burnside Distribution Corporation or Amazon where payment can be made using paypal. New Hep releases are now packaged in Digi pak form and these are suitable for airpost. This is to advise my customers that HepJazz, established over 40 years ago, is currently the subject of an attempted hijack by Jiang Zihihai of Hyayi Ltd based in Shanghai. This company is unable to think of a logo for themselves so they are trying to steal mine. This company has no connection with Hepjazz and should be avoided. As before, HepJazz CD 2101 is a collection of lesser known songs, and some new, with varied backing ensembles. The main arranging duties, as before, handled by Frank Griffith. The featured soloists include John Pearce, Ian Laws, Nicol Thomson, Freddie Gavita, Sammy Mayne, and guest spots for Duncan Lamont and Janusz Carmello. There are also four songs with accompaniment by the Bowfiddle String Quartet. Further launch details to follow. This album contains the following tracks - My Kinda Love / Lazy Afternoon / S'posin / Where Were You in April / I Wish I Knew / A Sunday Kind of Love / If You Go / An Occasional Man / Haunted Heart / You Came a Long way From St Louis / Manhattan in the Rain / I'm Through With Love. 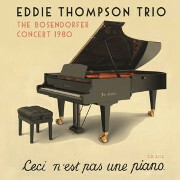 Eddie Thompson, one of the UKs finest jazz pianists, had a ten year stop over in New York before returning to the UK in 1972. He made some tracks in 1962 for a now defunct New York label with his trio. He also visited the west coast in 1975 and was recorded in concert as a soloist. This new CD combining these dates reminds us what a wonderful improvisor and artiste he was. This album will be available in late October just in time for a christmas present choice. 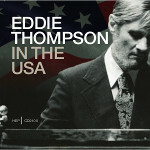 "Eddie Thompson in the USA", HepJazz CD2100 contains the following tracks :- Cherry / How Are Things In Glocca Morra / Shepherds Pie Time / Mood For Teachers / Guess I'll Have To Hang My Tears Out To Dry / Baby Mine / Home Brew / Bread For Ed / Chili Con Carne / State Occasion / All Too Soon / Dancing On The Ceiling / Laura / St. Louis Blues / Liza. 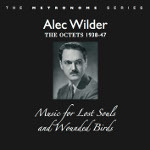 Eddie Thompson in the USA - "All Too Soon"
"Music For Lost Souls and Wounded Birds", The Octets 1938-47. Hep CD 97/98. Release date is the end of October 2014. American availability likely late December 2014. Check out the reviews of this album here! 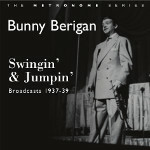 Thanks to an agreement with the Mills Music Library, University of Wisconsin and the efforts of author Mike Zirpolo, Hep Records are happy to announce that a collection of broadcast performances by Bunny Berigan and his Orchestra from New York locations recorded during 1937-39 is now available. These performances reveal that the Berigan band was every bit the equal of the more celebrated Benny Goodman and Tommy Dorsey bands of the day. Thanks to Doug Pomeroy's audio restoration these can be greatly enjoyed. This album contains the following tracks - You Can't Run Away From Love Tonight / Mahogany Hall Stomp / Mr. Ghost Goes To Town / They All Laughed / Big John Special / Back In Your Own Back Yard / Downstream / Louisiana / Peg O'My Heart / Royal Garden Blues / Trees / Howdja Like To Love Me? / Shanghai Shuffle / Let 'Er Go / Gangbuster's Holiday / Night Song / I Poured My Heart Into A Song / Swingin' and Jumpin' / Little Gate Special. For more details click on the album image above. 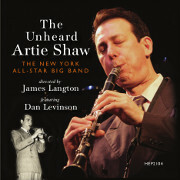 Check out the reviews at the Big Band Library and Jazz Weekly web sites or on our own reviews page.